"This salad is fast and easy to prepare but does not hold well and is best if eaten immediately!" 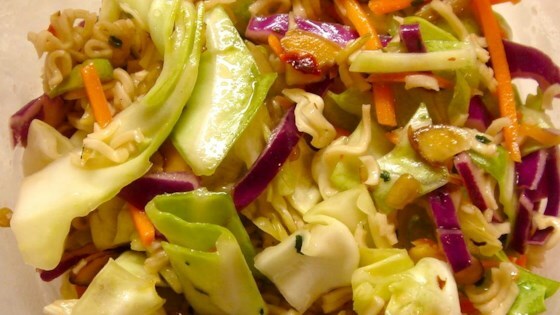 Toss together the cabbage, noodles and sunflower seeds or almonds. Whisk together the ramen flavor packet, oil, sugar and vinegar. Pour over cabbage mixture and toss evenly to coat. Yum! I usually use a bag of cole slaw or broccoli slaw and change up the vinegar (cider, balsamic, red wine) for variety. Great recipe. I also add 1/2 cup dried cranberries to the recipe. It makes it even yummier.